Keyframe is an event run by the Media and Animation Courses at Coláiste Dhúlaigh CFE in Coolock. Each year they welcome industry professionals, many of whom are ex-students of the Media and Animation Courses, to hear them talk about their work and how they found their way into a career in Media. 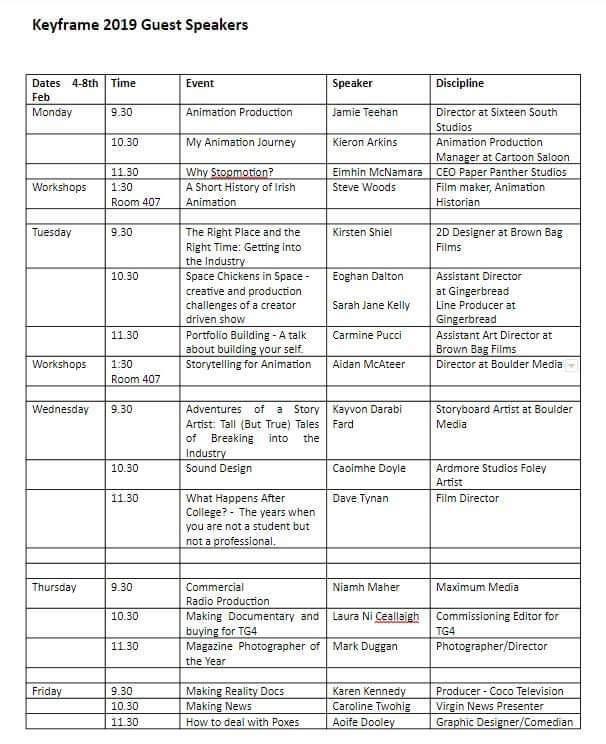 This year we have people from the world of Stop Motion, Film Directing, Foley Sound Design, Photography, News Presentation, Commissioning and Comedy. The talks start each day at 9.30 in the Coolock Campus and will run until approximately 12.30. All are welcome and the event is free, although places will be on a first come first served basis. Coláiste Dhúlaigh College of Further Education (CDCFE) hosted their annual Keyframe event this week. 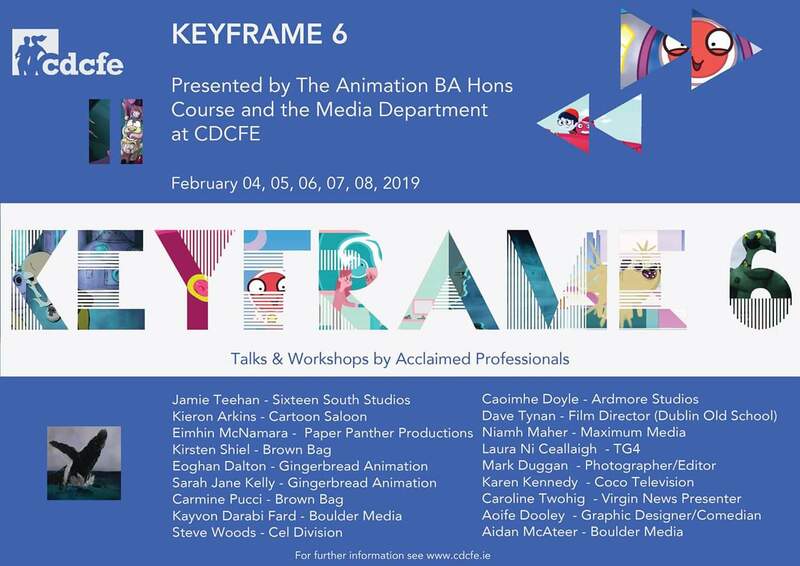 Keyframe 6 welcomed speakers from the animation and media industries to the college Coolock campus. The event, which is in its sixth year, gave students the opportunity to engage with and gain knowledge and advice from professionals who are working in their chosen fields, many of whom are graduates from the college. Speakers throughout the weeklong event included Jamie Teehan from Bafta winning Sixteen South Studios, creators of the Disney Junior show Claude. He spoke about his experiences of working with the American market on the new show Pinkalicious and Peterrific among others. Animator Kieron Arkins spoke about his work with Kilkenny based Cartoon Saloon, creators of the Oscar winning film Song of the Sea. Followed by Irish Animator Eimhin McNamara who gave demonstrations to students from his work with Paper Panther Studios. Other speakers from Ireland’s thriving animation industry included Kirsten Shiel and Carmine Pucci from Brown Bag films as well as Gingerbread Animation’s Eoghan Dalton and and Sarah Jane Kelly who are currently working on Space Chicken’s in Space for Disney XD channel. Kevin Lynch, head of the Animation course at Colaiste Dhulaigh said “Keyframe is a brilliant opportunity for students to get an insight into the industry and how to break in to it”. Four short films from Colaiste Dhulaigh’s Animation Degree course have been nominated for “Special Selection” at Animation Dingle 2019. The films nominated are Mamma’s Little Monster by Kelly Herbert, Sound Holds the Distance Travelled produced by Gareth Gowran and Sadhbh Lawlor, Dobrogor by Marek Winnicki and On The Radio written by Dave Cooney. Applications are now open for places on courses starting in September. For more information see www.cdcfe.ie.